The AccuStream™ Series of frame grabbers and video streamers is the most advanced, most versatile series of products from Foresight Imaging. AccuStream captures DVI, RGB, YPbPr, and monochrome video signals at up to 170 MHz pixel rates and up to 2048 x 2048 pixel resolution. The extreme performance of AccuStream is due to the 64 bit, 66 MHz PCI bus design, delivering sustained performance to system memory of 250 MB/second. For example, AccuStream can stream to memory 1280 x 1024 x 60 Hz video without dropping any frames. 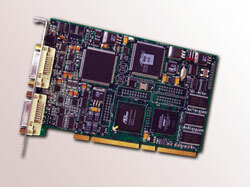 In addition to 64 bit, 66 MHz PCI, AccuStream is compatible with 32 bit PCI and PCI-X slots. The AccuStream Series is available in three versions, differing only in maximum pixel rate input: AccuStream 50, AccuStream 75, and AccuStream 170. The AccuStream continues in the Foresight Imaging tradition of delivering extreme accuracy and image quality for demanding customers with high resolution and precision applications. Extremely low pixel jitter of ±0.5 ns, superior analog design, and a 47 dB signal-to-noise ratio provide the accuracy and image fidelity required of high performance applications. Color video digitization is performed at 8 bits each of R, G, and B (24 bits per pixel) or 24 bit YPbPr. Monochrome acquisitions are at 8 bits per pixel. Pixel formats include RGB 24, RGB 32, RGB 5:5:5, RGB 8, YCbCr 4:2:2, YCbCr 4:4:4, and 8 bit monochrome. AccuStream achieves its extreme 250 MB/second sustained performance via its 64 bit, 66 MHz PCI bus mastering design, scatter-gather technology, and double buffering. This high performance requires minimal CPU intervention so that the processor is free to work on other tasks or process the data immediately. Real-time display is simultaneously enabled by real-time transfer of image data directly to display card memory over the bus. AccuStream also features independent, dual video data paths, allowing for the simultaneous DirectDraw display of YCbCr 4:2:2 color video and the transfer of full 24 bit RGB video data for processing. AccuStream acquires images and video streams from both non-standard and standard video inputs up to 170 MHz DVI, RGB, YPbPr, and monochrome. Input resolution is up to 4 megapixels total area. Active DVI, RGB, YPbPr, or monochrome loop-through output is provided. This feature eliminates the need for a separate, active video splitter to ensure high quality video input. For fine-tuning of the video signal, gain, black level, white balance, and phase controls are provided. Separate H and V sync are supported. An external trigger is available. AccuStream is fully compliant with the Display Data Channel (DDC) specification of DVI. It also features DVI Hot Plug Detect and Digital Monitor Emulation. AccuStream is supported by Auto-SYNC™, Foresight Imaging's flagship automatic configuration software. Auto-SYNC ensures quick and simple installation and image capture by automatically configuring AccuStream to the incoming standard or non-standard video signal. Auto-SYNC automatically analyzes the incoming video signal and builds a configuration file. Use the configuration file as created or utilize the Auto-SYNC Wizard for simple, step-by-step video adjustments. AccuStream is supported by the IDEA (Imaging Development Environment for Applications) software development kit. By using IDEA™, developers have the confidence of knowing that they can write their applications once and have support built-in for the entire AccuStream Series and I-Series™ product families. A Video for Windows driver and a TWAIN driver are included to further simplify development and use of AccuStream. With IDEA, ActiveX controls are provided to facilitate easy development with Visual Basic, Visual C++, and Visual J++. Extensive example programs (with source code) are provided with IDEA. Functions of the example programs include triggered acquisition, video streaming to AVI files, integration with Pegasus Imaging compression for streaming, overlays, and much more. Auto-SYNC, IDEA, example programs, and drivers are provided free of charge with each AccuStream. AccuStream is ideal for any application requiring high resolution and high performance imaging. With the lower priced AccuStream 50 and 75, AccuStream is also perfect for those high performance applications involving lower resolution video formats. Some of the popular applications for AccuStream include voyage data recorders (maritime imaging), military imaging, flight simulation, display monitoring, high-end multimedia, medical imaging, display monitoring, multimedia testing, and much more. Voyage data recorders: Acquire from high resolution ship radar screens. Flight simulation: Acquire from high resolution simulation displays. Medical imaging: Acquire from virtually any medical imaging device. Display monitoring: Acquire from high resolution displays. Military imaging: Acquire from high resolution video screens for command & control. Press Here for information on how to order the AccuStream 50, 75 & 170 and cables/accessories.